Come to My Heart Garden: Superb summer lilies and Heart Garden happiness . . . Superb summer lilies and Heart Garden happiness . . . This summer has suited many of our lilies. There's been plenty of rain. I've given them plenty of food. Mostly though, we haven't had strong winds to knock them around. Here's a photo of me in my role of civil marriage celebrant, task completed, champagne in hand, standing smiling by the magnificent lilies our son and his family gave us for Christmas. In Australia, we call these white fragrant beauties 'Christmas lilies"
The crinum lilies are coming into flower now, with their soft pink petals, and exuding their gentle scent. The spicy exotic perfume of the ginger lily will soon be filling the garden. I got such a surprise to count the small private weddings here since Spring began on September 1. Twelve were in the Spring, seven in Summer. And seven Heart Garden weddings were in the Summer. And all the weddings were so happy and successful, each one unique and special. And just one more to go before the Autumn weddings begin. I get to share the joy of so many couples as they begin their married life together. I surely have the best job in the world! 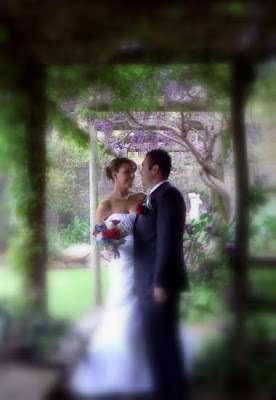 Because small private weddings, affirming and celebrating love, are held in this unique, memorable and tranquil place. Who is the Heart Gardener? Michele Bolitho is the Heart Gardener in more ways than one. She is also a Civil Marriage Celebrant in Canberra, Australian Capital Territory who shares her beautiful romantic garden for small, weekday weddings. This blog is dedicated to all the garden-lovers of the world. Enjoy . . . Sadly, Google has deleted all slideshows on Blogger. You can now find the month-by-month slideshows on my Pinterest page. I also like to put Heart Garden photos on Instagram. © Michele Bolitho 2012 The Heart Gardener Australian Capital Territory. Awesome Inc. theme. Powered by Blogger.